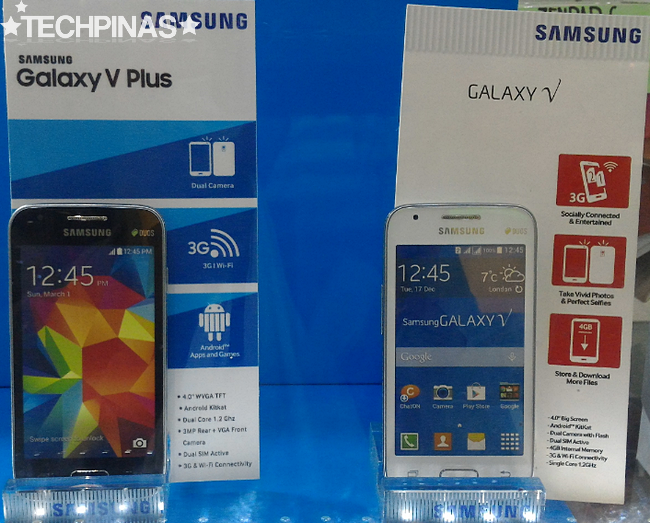 Samsung Galaxy V Plus Philippines Price is Php 3,990, Out Now! Complete Specs, Key Features! I was walking around SM San Lazaro yesterday evening when I saw this tarpaulin in front of one cellphone store at the CyberZone area. 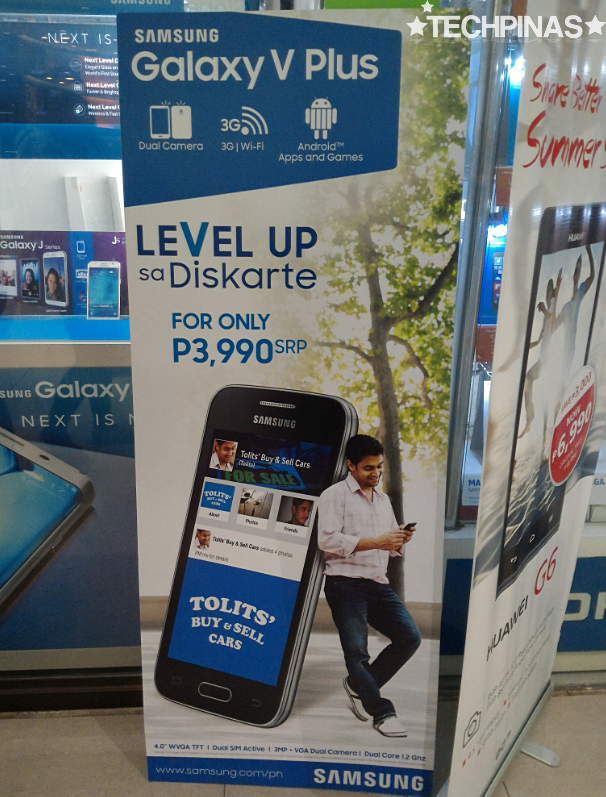 Yup, the 2015 follow-up to the well-received Samsung Galaxy V has just been quietly released in the Philippines by the Korean Giant. 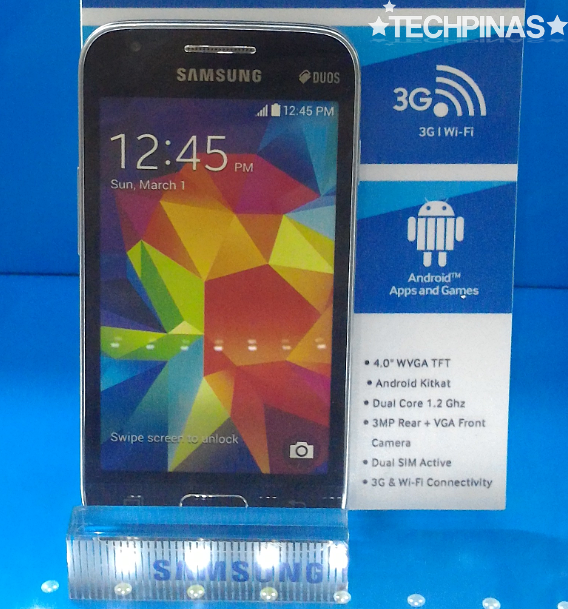 Priced at only Php 3,990, Samsung Galaxy V Plus is currently the most affordable Android smartphone in the company's 2015 global product line-up. The handset looks largely the same as its predecessor but it does come with a number of enhancements under the hood. Apart from flaunting almost the exact same shell of the 2014 model, Galaxy V Plus also borrows more than a handful of technical specifications from its older sibling. Both handsets are equipped with a 4-inch WVGA TN panel, a 3.15 MegaPixel fixed focus camera, VGA front cam, Dual SIM Dual Standy capability, 3G HSPA connectivity support, and a removable 1,500 mAh battery delivering around a whole day of uptime with regular use. Under the hood, both phones have 512MB of RAM for multitasking and 4GB of ROM (1.9 GB of which is available to the user for storage) that can easily be augmented using the device's microSD expansion slot. What makes the two phones different from each other is that the newer model has a 1.2 GHz Dual Core ARM Cortex-A7 and Mali-400 GPU based Spreadtrum SC7727S chipset while Galaxy V is only powered by a 1.2 GHz Single Core SoC. The multi-core chip on the Galaxy V Plus likewise enables it to take HD 720p videos which the 2014 model doesn't support. Is this phone right for you? If you're currently looking for a sub-Php 5,000 Android smartphone, this is certainly a model you should consider. Though, keep in mind that for Php 3,990, you can already get a handset from other brands - mostly local, some Chinese - that have far superior technical specifications than Samsung Galaxy V Plus. However, if you're a big Samsung fan and you're not open to getting a handset from a Pinoy company or any other brand for that matter, then I guess this release fits you perfectly.